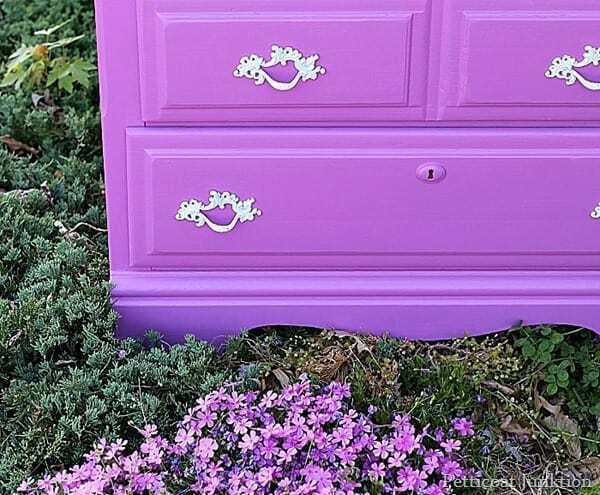 Today’s the day for girly furniture. It’s been a while since I’ve used a totally fun, bright paint color. 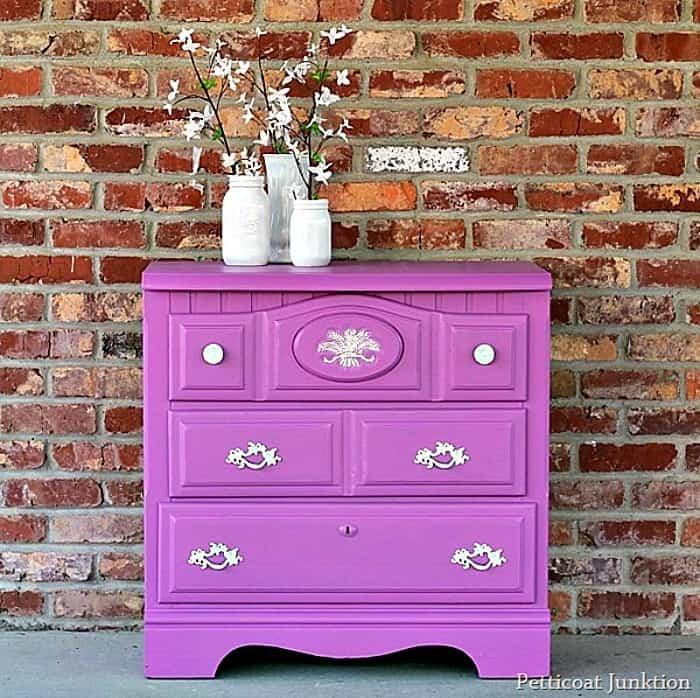 Radiant Orchid was the perfect color for this furniture makeover. Yep, it looks girly to me. How about that color. I have to admit the nightstand is my first orchid project…..or purple…or anything close. I found the nightstand/table at the Southern Kentucky Flea Market last week. I thought it looked pretty good until I unloaded it at home and got a glimpse of the damage to the bottom edges. 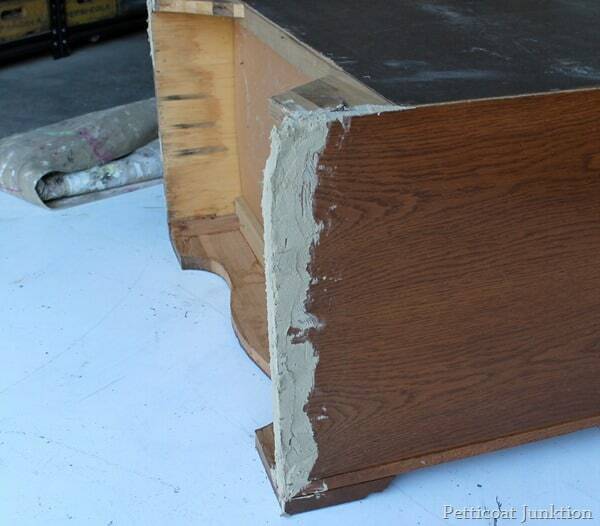 Why do furniture companies make pieces with solid wood drawers and use mdf or fiberboard for the sides?? Makes no sense at all. The JTS started repairs on it before I could get photos of the damage. You can tell from this shot…it was pretty bad. He troweled on lots of wood putty trying to give the bottom edge some structure. This is how it looked after I sanded down the wood filler. Not bad. The original hardware was not to my liking at all. I wanted this piece to have a French Provincial look so I went through my hardware stash and the only French Provincial looking handles with a matching set of four were these. the screw holes for the original handles did not match the screw holes for the new hardware. I had to putty screw holes and drill more holes for the new hardware. To See how I updated the hardware by drilling new holes and filling the old ones. 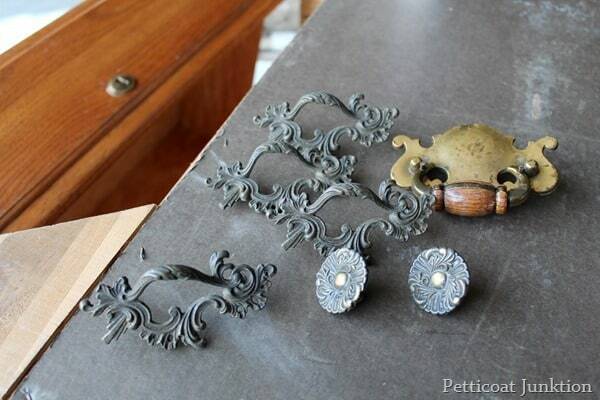 Just click here….How To Update and Replace Furniture Hardware. 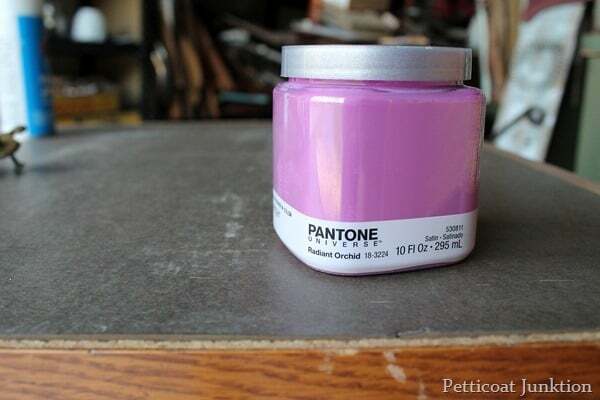 I got a sample jar of the Pantone Radiant Orchid at Lowes. I only used maybe half of the sample to paint the nightstand. The hardware got a makeover with a generic brand white spray paint and gloss acrylic spray. I first dry-brushed the floral detail but it wasn’t white enough so I finger painted it with the tip of my pinkie….really. My video below on how to fill hardware screw holes with wood putty…. Great job, Kathy! I love it! Kathy, I love the color. CUTE, CUTE, CUTE ! My niece would flip over the color. Nice job. You are a good teacher for the beginners, like i am, even not beginners, but for dreamers. 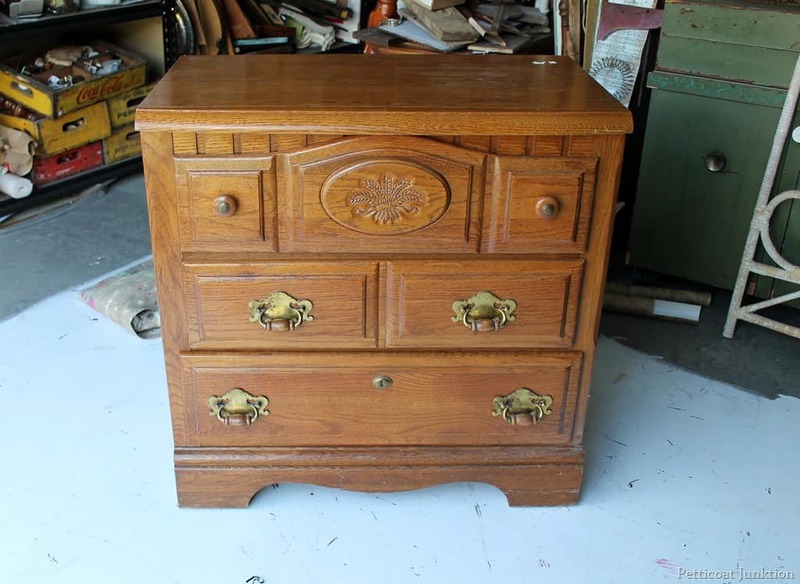 I have a very old my grandmother dower chest, which would like to renovate. It is the only items i still keep. And think your job somehow motivated me… Sorry for my English. If you don’t mind i will ask you some question if start this project, OK? Thank you in advance and wish you stay as creative as you are! Lydia I will answer any of your questions.Gettingu started is the hard part.Once you do it’s a piece of cake. Thank you for the kind comment. Feel like you are so open person and ready to share with others your skills and knowledge. This is beautiful…what a happy color…Thanks for sharing! 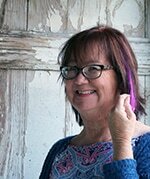 My first time on your blog but I will be back! I have just recently started shopping used furniture. 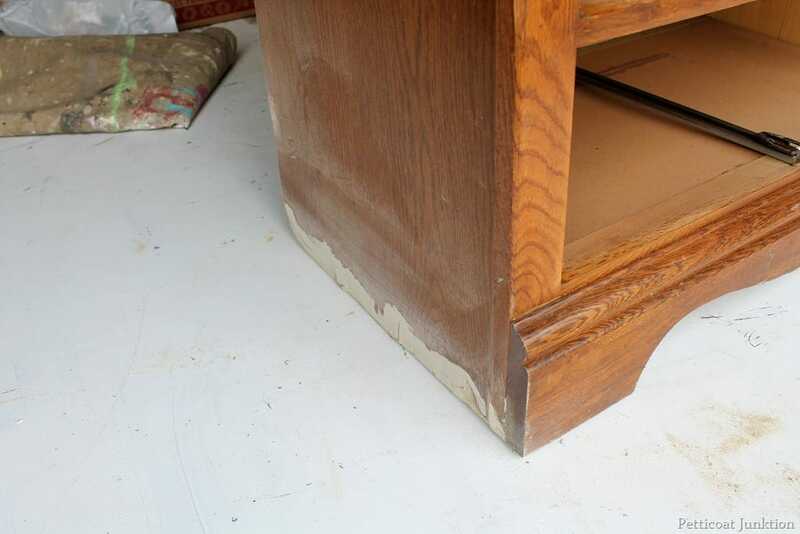 I became irritated at myself when I found damage that I felt I should have caught before buying the piece. I like your cool confidence that you will fill, sand, or repurpose pieces. You make it seem like an adventure rather than a mistake! Thanks for your wonderful blog. I look forward to reading it each time. Is Pantone a furniture paint? Question- you said you only used half the sample- you must have a way with paint. Did you use a brush or roller on this piece? I’ve been trying to read past posts to remember which you prefer for a project like this. I’m slowly building the confidence to start my own project. Kate, Thank You!! I use brushes and rollers. I don’t really think it matters as far as coverage. I believe I used a brush for the first coat and a roller for the second coat. The first coat of paint covered really well so the second coat was basically a touch up. I use foam rollers…the firm kind…not the soft yellow ones. I think there has been a huge improvement in paint manufacturing over the years so the paint covers really well. Very bright and cheery Kathy!! Love the contrasting white hardware too. I really liked this color. It gives the piece a whole new vibe. 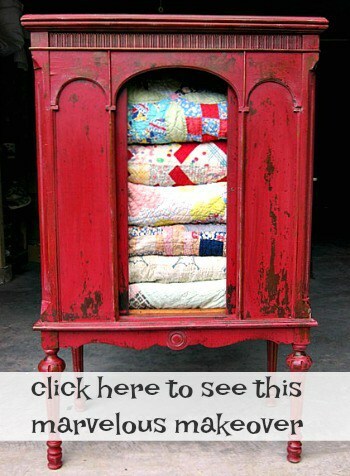 I plan on doing this on a small cabinet. Thanks! One thing I like about your blog and work is that you use all kinds of paint and do not try to promote one brand, even what you sell. You try many different colors/brands/techniques and happy to share. Some retailers/bloggers seem to be obsessed with one kind of paint—nothing objective about what others sell or use. You are very down to earth about what you do and how you do things. You also do not mind constructive criticism. I know some bloggers go into a fit if a reader even suggests doing something a different way or a way that they may improve a bow or a tutorial. Thanks for just BEING YOU!!!! and not taking comments as a personal attack. Thank you for the comment LaDonna. I am a really down to earth person. If I ever get the big head you guys need to bring me down to earth again! You are right. I feel I can be more creative by trying different products and brands and I love doing that. Hey…you never know when you will find something better. Thanks again and have a great week! That is sooooo cute!!! love it Love it! 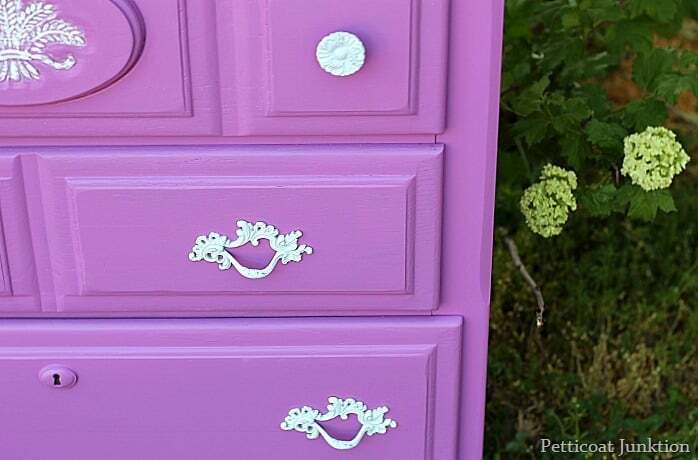 Just come over and paint some furniture for me…I am a dummy when it comes to paint colors and trends and hardware!! Stunning! I love the color. Every home needs a beautiful piece of furniture that makes a statement. I have two end tables and a hutch that is the same as this piece. Wish i could share a pic here. What a fun color! I imagine this being right at home in a teen girl’s bedroom. Can’t wait for the hardware post! I can never seem to get it right on the first try. Kathy, Kathy, Kathy! I bought the sample jar at Lowe’s as well and just been looking for the right project. I was going to use your “Hollywood” glam look on a chest/bookcase in my bedroom, but now that I see this, I’m getting weak! Thanks so much for sharing. You are brave with your colors and I enjoy it so much. Very pretty, especially with the white hardware and embossed wheat. 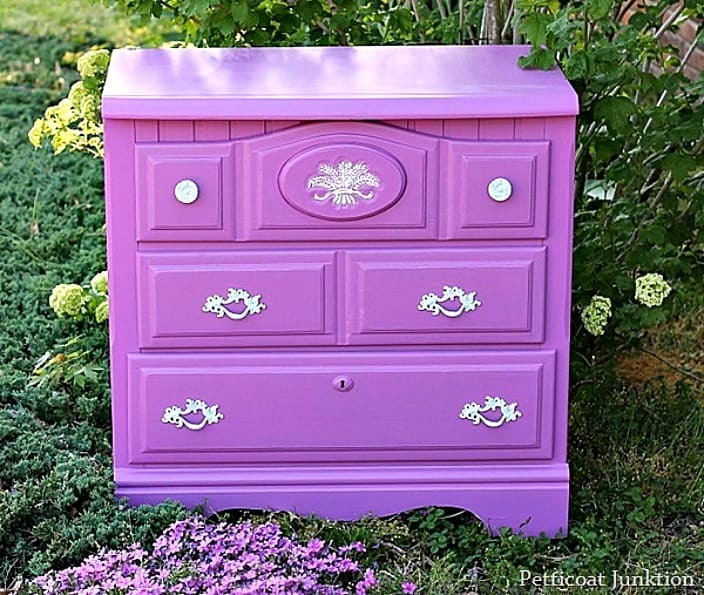 This would be wonderful in a girl’s room or even for a woman that likes frilly bedroom decor.